Ukrainian nationalists carried out a torch-lit march in central Kiev on Sunday to support the government’s military operation in the country's southeast, which has already led to the deaths of over 5,000 people. 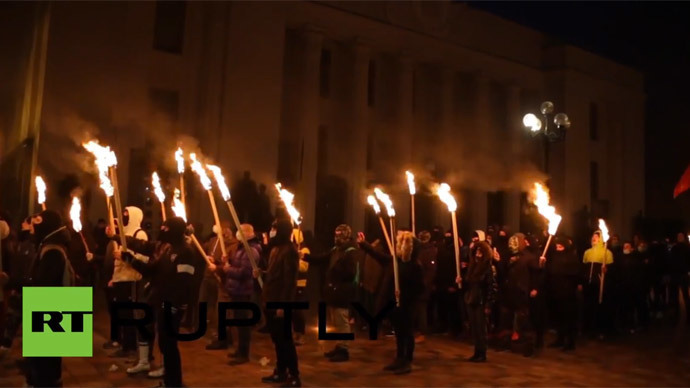 Several hundred young men wearing balaclavas and carrying burning torches marched from the Verkhovna Rada (Ukrainian Parliament) to the Presidential Administration building. The demonstrators chanted offensive slogans aimed at the Donetsk and Lugansk regions, which have stood up to Kiev's military aggression. Order during the march was disrupted by fireworks, flares, and smoke bombs. The action was organized by the Chesne Slovo (Honest World) organization, which sees “the promotion of development of the Ukrainian national idea” as one of its core aims.